We hosted a Christmas Dinner/ Feast for two of our dear friends last Friday night. I had a blast planning the menu and trying to find a yummy main for my beautiful friend who also is a vegetarian. Now I don't have a problem using imagination for meat free meals normally, as we eat that a lot here. The mulled wine was a little bitter as I think I let it simmer too long but it was still worth a try. Preheat oven to 180°C. Grease and line a 39 x 26cm Swiss roll pan. To make the roulade, heat the oil in a large saucepan over medium-low heat. Add the leek and cook gently for five minutes until soft. Remove leek from pan. Wipe pan, then add the butter. When it has melted, add the flour and cook for 1-2 minutes, stirring constantly. Start adding the milk, a little at a time, whisking until all the milk is combined and the sauce has thickened. Remove from the heat, beat in egg yolks, one at a time and season. In a separate, clean bowl, beat the eggwhites until stiff. Add a quarter of the eggwhites to the roux, then gently fold in the remaining eggwhites. Fold in leeks and cheddar until just combined, then pour into the prepared pan and bake in the oven for 20-25 minutes or until golden and puffed. Meanwhile, to make stuffing, melt butter in a frying pan over medium heat. Add onion and cook for five minutes until soft and translucent. Add garlic and breadcrumbs and cook for a further 3-4 minutes. Stir in herbs and season with salt and pepper. Set aside. For the filling, steam or boil the sweet potato until tender. Drain and mash with the butter, cream and nutmeg. Season well and set aside. When the roulade is cooked, place a clean tea towel on your workbench and sprinkle with the parmesan. Turn the roulade out onto the tea towel and peel off the baking paper. 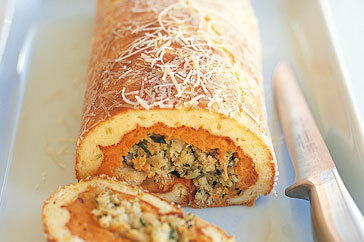 Allow to cool for 1-2 minutes, then spread the sweet potato over the roulade. Sprinkle the stuffing over the sweet potato. Using the edge of the tea towel, carefully roll up the roulade from the longest side finishing with the seam-side down. Slice and serve warm.